Jon Cronshaw, PhD, is the political reporter at the Halifax Courier. A driver in Halifax town centre made a lucky escape after being told by a passing lorry driver that his car was on fire. “There was this lorry driver flashing at me and pointing to the flames and smoke coming out the front of my car - I couldn’t see them at first,” said driver Ahmed Hassan Chaudhry of Halifax. 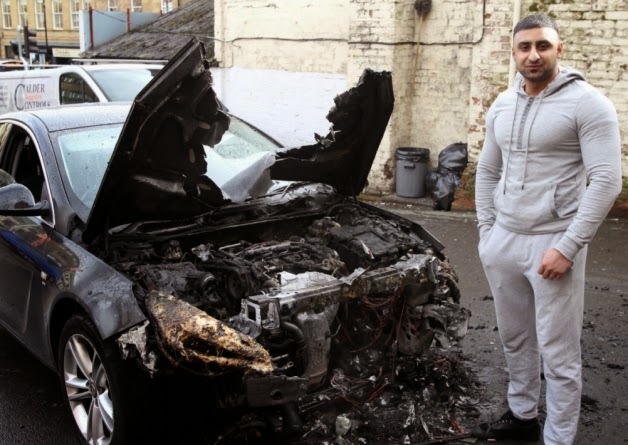 Mr Chaudhry pulled his car onto the forecourt of National Tyres on Bull Green where the car’s engine burst into flames, frightening onlookers. “I pulled the car off the road and it burst into flames and blew up - imagine if that happened on the motorway - I’m lucky to be here,” he said. West Yorkshire Fire Service were called to the incident to put out the blaze. Mr Chaudhry had bought the 2010 Vauxhall Insignia only three weeks prior from a private seller and was dismayed that his new car had set ablaze. This article was orignally published in the Halifax Courier on March 7, 2014. 50 of the best Keep or Cull articles expanded, edited and revised.